Since mid-February otter conservation organisation, the International Otter Survival Fund, have been helping missionaries in the Democratic Republic of Congo to raise an orphaned Congo Clawless Otter. Due to commercial hunting for meat and fur, the Congo Clawless Otter population numbers has undergone severe decline. In an area, where it’s the culture to hunt, the saving and raising of a rare wild creature has generated much interest and amazement within the local population (and further afield!). It has created an environment for conservation education, which has now become a focus of learning in, and outwith, the Congo village of Kikongo in Bandundu Province, where wildlife, habitat and land is constantly under threat. IOSF immediately arranged for otter milk substitute to be despatched, whilst in the meantime Rita and Glen improvised – eventually the milk was delivered by supply plane. A week later, the cub was thriving and had grown 8cm! Very soon, a network of zoos, vets and other otter conservation groups were pooling their expertise and knowledge, via email, to help Rita and Glen. In the local language, the word ‘Mazu’ means noise – and this is what Glen and Rita called the young orphan. It’s particularly apt, as Mazu makes a variety of noises – a range of happy snuffling, sighs, small whistles, tweets, twitters and squeaks. Very quickly the word spread, that something unusual was happening in Kikongo - supply pilots, visitors to the area, local dignitaries and visiting students are all anxious to meet Mazu and learn about her (and conservation!) The Chapman’s live close to the village’s airstrip, and many people in transit, now stop by to see Mazu, and learn more about Congo Clawless Otters. A politician from Kinshasa also expressed an interest to meet Mazu – he’d heard about the conservation programme being carried out with her ‘help’ – when he visited, this also facilitated an opportunity for local villagers to put forward a delegation, and engineer conversations about land use. In the meantime, Mazu is learning to catch her own fish, taking great pleasure in rolling, playing and eating the non-native water hyacinth – like most otters she combines eating with play, and Rita and Glen admit that they are now ‘trained’ in carrying fresh supplies from the river each day. Grace Yoxon, of IOSF, says, “Working with Glen and Rita and Mazu is so exciting. When we first heard about Mazu we were all just concerned with helping them to rear her, but what they are doing for otter conservation through her is simply amazing. We also now have a network of experts around the world working with us, and, of course, Rita and Glen, who can share their knowledge and expertise. This network sprang into action once again (in May), when another cub (this time a Spotted Neck Otter) was found on the other side of the Congo. People worldwide have been following Mazu’s story on the IOSF Blog on our website, and it is great to have this support. The milk we sent for Mazu has to be imported from America; we also use it for the cubs we care for at our Skye sanctuary. Cubs stay with their mothers for about a year, so we have to release them at the same age as otherwise they won’t survive. This makes it very expensive and so the support we receive is vital. Image notes for editors/publishers: you are free to use any of the images listed, to accompany this story and they should be credited to Glen Chapman. However, a voluntary donation would be greatly appreciated, no matter how small (or large!) 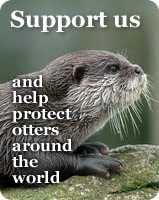 to support the IOSF’s work, helping the otters of the world. *There are two types of otter in the area – Congo Clawless (Aonyx congicus) and the Spotted Neck Otter (Lutra maculicollis). The Clawless Otter is the second largest otter in the world. This species resides around wetlands, streams or ponds in the rainforests of Central Africa. Although most otters are considered aquatic, this otter is thought to be more terrestrial. The Congo Clawless Otter is dark brown in colour which helps it blend into its muddy surroundings. White tips of the hairs on the dorsal head and neck area give it a silvery look. The chest, nose, and ears are white. There is also a very distinguished patch of dark fur between the eye and the nose on each side of the face. The front feet have no claws or webbing. The back feet have very small claws, which are partially webbed. The Congo Clawless Otter is a larger than most species, with a total length of 118 to 156 cm, with 40 to 59 cm of it being the tail. Adults usually weigh between 15 to 25 kg. The Congo Clawless Otter is very similar in appearance to the Cape Clawless Otter (Aonyx capensis). However, the Congo Clawless Otter has a more slender head and neck, the cheeks tend to be white rather than beige as in the Cape Clawless, and the dark mark between the eye and nose is more prominent. A less obvious distinguishing characteristic is the more deeply cusped molars. Predators: birds of prey, crocodiles, leopards, pythons, and man. Otter bush meat is common in Congo and Cameroon, but not in Gabon because of its reputation of being a dangerous animal - the myth in Gabon is that otters can give electric shocks when caught with a spear. Some people don’t like to eat otters because of the smell which can linger! Otters are also thought to be magical and possess powers that when you catch an otter, skin it, and wear its fur, you are thought to become invisible to your enemy. This emanates from the belief of the otter’s ability to escape fish traps. Its fur is also used in Cameroon to make drums. All 13 species of otters are protected by the Convention on International Trade in Endangered Species of Wild Fauna and Flora (CITES) - a worldwide treaty developed in 1973 to regulate trade in wildlife species. He was setting fishing lines in the swamp, and heard a noise and waded over to a log to investigate. The mother jumped out with the baby in her mouth. He pursued the otter, who in the process dropped the pup. He continued after her until he was able to kill her and then went back into the swamp to recover the baby. He then described with tenderness how he found the baby spluttering in the water, how he picked the baby up and dried her off with his shirt. What a contrast between the sheer courage and skill of a hunter, and his compassion for a helpless baby animal whom he had just orphaned. He said it took him a long time to figure out what he had killed. It is rare to see an otter, much less to kill one. *The ‘help’ network of experts around the world, together with the IOSF, and, of course, Rita and Glen, shared their knowledge and expertise once again (in May), when another cub (this time a Spotted Neck Otter) was found on the other side of the Congo. *The villagers are learning more about otters – Mazu likes to eat small water snails and local people had said they had seen piles of these, but didn’t know what creature was eating them. They were shown tracks made by Mazu, and now they are able to identify that it’s a Congo Clawless Otter, that has been snacking on the snails. "Living with Mazu while we have full time work is a real challenge. If she was just a pet, I don't think we could handle it. The motivation for us is that Mazu is such a lesson for conservation. As for visiting schools, all I have is a bicycle, and an ultra-light. Not ideal for transportation. We haven't even put Mazu in a canoe yet, but with the river rising, a canoe may be a good solution to accompanying her along the river. “Glen shows videos on a big white sheet on the soccer field. Crowds come; spreading cloths and mats on the ball field as a variety of films are projected. Often, these include excerpts of nature and conservation films that Glen translates for the audience. Visual aids like these are popular, and we hope will bear fruit as our growing population moves from hunter/gatherer to an appreciation for the benefits conservation can bring them." The International Otter Survival Fund (IOSF) is one of the world’s leading otter charities, and was inspired by observing otters in their natural habitat. In the UK IOSF is the only charity solely dedicated to the conservation, protection and care of otters based on 20 years of scientific research in the UK and around the world. Because the otter lives, feeds and plays on land and in the water and is at the peak of the food chain it is an ambassador species to a first class environment. IOSF was set up to protect and help the 13 species of otter worldwide through a combination of compassion and science. The IOSF support projects to protect otters, which will also ensure a healthy environment for all species. + Otter Hospital – on Skye there is a specialist rehabilitation centre which cares for injured and orphaned otters from throughout Britain. + Education – IOSF runs courses for people interested in otters and give talks to schools, natural history groups, etc. + Campaigns – The major campaign (Furget-Me-Not) is to combat the fur trade in south east Asia, starting in Cambodia. In the UK IOSF is supporting the call for a ban on the use of snares in Scotland. International projects include the Marine Otter in Chile, Spotted Necked Otter in Kenya, Eurasian Otter in Ireland, Hairy Nosed Otter in Cambodia. To date the IOSF have had projects in 30 countries and helped to support cubs in 12 countries, besides their own work in Scotland.